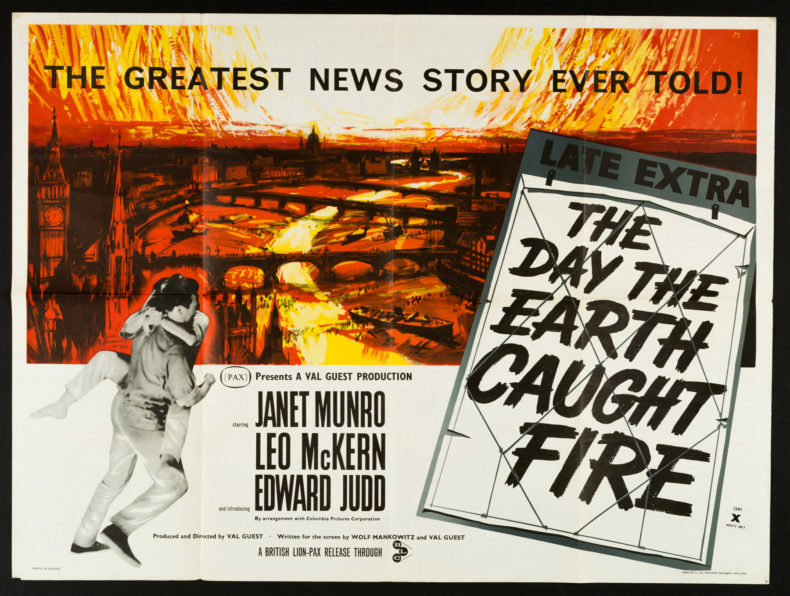 As with rather many science fiction catastrophe movies, to call the underlying science in The Day The Earth Caught Fire dodgy is too kind. It is so fanciful it should not have the word science, however heavily qualified, associated with it. Thankfully, therefore, the cause of the catastrophe (two simultaneous nuclear tests altering the Earth’s tilt and orbit) does not really matter to the plot: people off stage cause a catastrophe and then people off stage try to fix it whilst the film concentrates on journalists reporting the unfolding story. That focus on journalism makes the film, released in 1961, still seem relevant despite its dated aspects. Relevant as we see in the film journalists fixated with Ascot stories, flirting with silly reader offers, loving running health scare stories and speculating over Royal pregnancies. The printing equipment in the film may be dated; the stories the journalists talk about is all rather familiar. In other respects, the film is very dated – smoking on screen, special effects that really show their age and, perhaps most strikingly for a British audience, the Daily Express presented as the epitome of high-quality journalism. As with most such films, you have to give them a fair degree of slack to enjoy them. If you can enjoy the technical skill of those who did the special effects even as you see how crude they are compared to current standards; if you’re willing to turn a blind eye to the inevitable stereotyping of women into mostly submissive roles; if duff science can be forgotten then there is much in the film to enjoy – both as a tale of science fiction and as one of journalism. Buy The Day The Earth Caught Fire from Amazon here.